I’m sure you’ve probably came across that slogan before. If you eat more fat, you’ll burn more fat. Now, I’m all for people including plenty of fat in their diets. In fact, I’ve spoken many times about the problems that arise from “fat-deficient” diets. So please don’t go avoiding dietary fat.. However, telling people that they should “eat more fat to burn more fat” may be misleading. Not because you won’t “burn more fat” on a high-fat diet but because the practical implications of this are different to what most people will think of when they hear that statement. You see, ‘fat-burning’ as a term can be quite deceptive unless we define what context we mean it in. For most people just seeking general fat loss advice, the term fat-burning will simply mean that they’re losing body fat. However, to someone with a deeper understanding of human metabolism it will be seen as a slang term for fat oxidization. So what is fat oxidization? We’ll get into this later. First we need to track back and look at energy storage and energy usage in the body as a whole. And mention something about the whole calories in/calories out (CICO) equation that there is (for some strange reason) so much debate about. 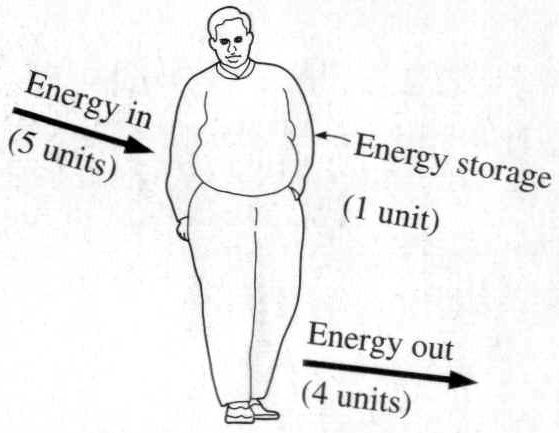 As a reminder, when we talk about energy balance we’re really talking about the law of conservation of energy. More specifically we’re talking about the 1st law of thermodynamics, a version of the law of conservation of energy, adapted for thermodynamic systems (Physics FTW!). With regards to the human body we talk about energy in terms of the unit of calories. And so essentially, we’re saying calories have to be “conserved”. Calories coming in from food being equal to the calories we expend via all the various output processes we have (metabolic rate, exercise, non-exercise activity thermogenesis, thermic effect of food, body heat production, etc.) plus the calories stored. As shown in the below diagram. First, the CICO equation is very complex. It’s certainly not a simple input vs. output equation as we might be inclined to think on first examination. For example, if it was a simple equation then we’d expect that if my “maintenance” calories are 2,500 kcal/d and I eat 2,600 kcal then I should in theory be gaining weight, as I have increased energy in. But even from an instinctive point of view we know this doesn’t practically play out. I mean there are many people who stay the same weight (or at least within a few pounds) over long periods of time (say 12 months or even many years) without hitting the exact same calorie intake everyday. Energy in affects energy out. As an example, in the June edition of Alan Aragon’s Research Review, Alan mentioned an overfeeding study by Levine and colleagues. They did an overfeeding study where non-obese subjects were overfed by 1,000 kcal/d for 8 weeks. But the effect wasn’t what would be “predicted” by a 1,000 kcal surplus. The reason? When we overeat the body initiates responses to increase energy expenditure in an attempt to maintain leanness. Two-thirds of the increases in total daily energy expenditure were due to increased non-exercise activity thermogenesis (NEAT), which is associated with fidgeting, maintenance of posture, and other physical activities of daily life. NEAT was seen to be able to increase by almost 700 kcal per day! Pretty astounding right? And pretty much every overfeeding study will show this. The subjects’ bodies respond to the increased caloric intake by increasing body heat production, turning up thyroid activity, increasing subconcious fidgeting and being capable of expending more energy during workouts. It’s our body’s way of attempting to stay at a certain bodyweight. How energy in affects energy out includes differences in the thermic effect of feeding between diets of different protein intakes. Then we also have the issue of digestion. If someone is malabsorbing food and excreting potentially usable calories then energy out is increasing. Studies also show that inflammation will affect energy expenditure. Plenty of other examples of how energy in changes energy out exist. Different foods and different macronutrient breakdowns do NOT have the same metabolic effects. Calorie intake is the master of body composition change. But diet quality still matters. Changes in the “calories in” side of the equation will cause a knock-on effect and change the “calories out” side of the equation. Now it’s important to realise that the number of fat cells (adipocytes) we have as an adult does not change nearly as much as their size and fat content. When we start putting on fat, first the adipocytes will start increasing in size, i.e. more fat is being stored in each fat cell. But if we continue to put on fat, the cells can’t just stay getting bigger and bigger, so we create new adipocytes to store the excess fat. But when we start losing fat the reverse does not happen. Instead we simply release fat from the adipocytes so that they shrink in size. However, the number of adipocytes doesn’t actually change. So to a certain extent, rather depressingly, once you create new fat cells you are not really going to lose them. On the upside, you can however shrink them and release fat from them. So how do we avoid creating new adipocytes and stay lean? First, let’s look first at what it takes to put fat into a fat cell and what it takes to release it from a fat cell. conversion of glucose to fat. Accounts for a relatively small part of the equation. the breakdown of stored fat. Involves hydrolysis of triglycerides into glycerol and free fatty acids. Much of my thoughts around this topic of “fat flux” have been borrowed from the excellent Peter Attia, who wrote an amazing post on these processes that goes into more detail than what I’m about to do. So I’ll lay out what I feel are some important points and then refer you to this post by Dr. Attia if you want to dive into more of the nuances and details. Let’s look at the three processes above. 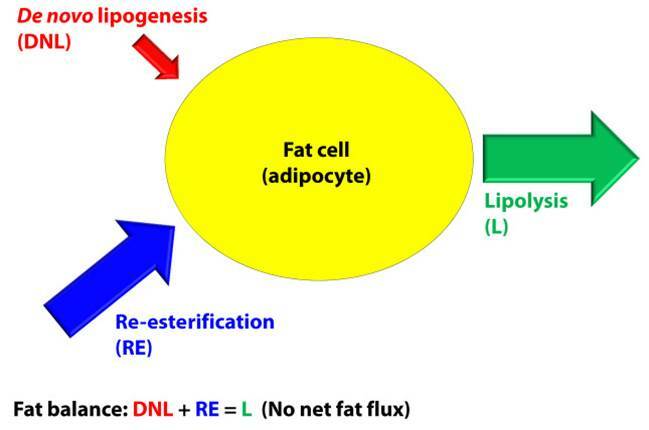 The first two (DNL & RE) relate to putting fat into a fat cell. While lipolysis is the process of releasing fat from a fat cell. So we can said to be in a state of fat balance when the amount of fat going into the cell is equal to the amount of fat leaving the cell. 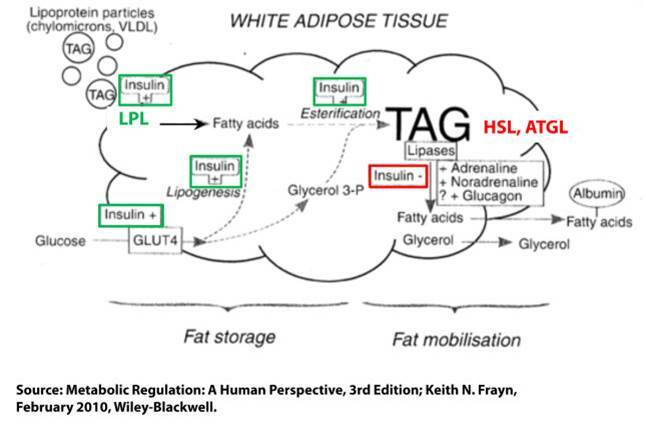 Therefore if we knew what regulated each of these processes then in theory we could perhaps work out a way to increase fat release and decrease fat storage, right? If there is a way to do this without changing calories then we have found our holy grail of a metabolic advantage to a certain way of eating. Possible? The three processes of DNL, RE and L are impacted by 5 different “players”: Lipoprotein Lipase (LPL), GLUT4 transporters, Lipogenesis, Hormone-Sensitive Lipase (HSL) and Adipose Triglyceride Lipase (ATGL). As the diagram below shows, all of these players are regulated by the one and only… INSULIN! Result? Insulin promotes the processes involved in fat storage and inhibits the processes of fat release. When we talk about increased fat storage, are we talking about increasing body fat levels? Let’s break this thing down (cue spontaneous hip-hop music breakout). Take one snapshot in time. You may be actively storing fat away in fat cells at that point. A typical instance would be after a meal. You take in food, it’s broken down into it’s basic components and you now have a huge availability of substrates that can be used for many processes, including energy production. So if we don’t need the fuel for energy immediately does that mean the excess energy is going to cause us to gain fat? Well, certainly we may put it into fat cells. Sure. BUT (and this is the point SO many people miss) just because we store this energy as fat right now, does not mean we are going to put on body fat. Now the 24 figure is arbitrary but you get the point, it needs to be over a prolonged period. This gives way more insight than fat storage status at one snapshot in time. Why? Because while fat storage occurs at meal times, the periods between meals and during sleep, we will release fat from fat cells. So fat gain is determined by the NET EFFECT over a prolonged period of these continual fat storing and fat releasing cycle (see diagram below). What will determine whether net fat storage exceeds net fat release over a certain period? Gold star if you answered “calories”. Honestly, it’s not the carbs making you fat (or the dietary fat or the protein for that matter). Yep, just because you store fat doesn’t necessarily mean you are getting fatter. You see, fat storage can be a transient process. We are going to be both putting fat into and taking fat out of fat cells. Everyday. Regardless of calorie or macronutrient composition (outside of starvation perhaps). By this I mean that fat storage and fat release are dynamic processes. If you are storing fat in fat cells at a particular time point, this doesn’t mean that you are “getting fatter”. Similarly, if you are in a position where more fat is being released from a fat cell than is coming in, at one point in time, it doesn’t mean you are automatically getting leaner. OK, if you did ask one of those questions then you deserve some credit because you were at least paying attention to the previous section when I talked about the 3 processes regulating fat movement in and out of the cell. So kudos for that. BUT you are also missing a key part of the picture. One which a LOT of people miss. High-carb diets mean continuously elevated insulin levels. Insulin is needed for fat storage to occur. In this situation above we are in a state of “fat balance”, i.e. the same amount of fat is entering the cell as is leaving the cell. So as some of you bright sparks noticed, we can affect these processes to some degree by manipulating insulin. For example, elevated insulin leads to inhibited lipolysis. So it’s natural to presume that this means just go on a diet that keeps insulin low, which in turns keeps lipolysis higher. And you are correct. Lower insulin will mean increased lipolysis. But does that mean it will cause us to go into a state of negative fat flux, i.e. more fat leaving the cell than entering it (and therefore net fat loss)? Eh, not so fast. This is where we need to take the 30,000 foot view as Tom O’ Bryan would say. If we focus narrowly on one thing (in this case, one action of one hormone) then we miss the bigger picture. Think about a practical situation where this rock bottom insulin level may be present: a ketogenic diet. Carbohydrate intake is super low, protein intake is low to moderate and so insulin levels are as low as we could wish for. Does lipolysis increase in this state? YES! But what else happens? Well, as we’re now eating a high-fat diet (70%+ of daily calories) there are a lot more fatty acids available in the bloodstream after the fats are digested. So this leads to a large increase in re-esterification. So the amount of fat going into the cell increases. So while fat leaving the cell via lipolysis has increased, fat entering the cell via RE has also increased, so the NET RESULT IS THE SAME! On a completely different diet at the opposite end of the spectrum, a high-carb diet, while this will mean a reduced level of lipolysis, it also means much less incoming fat via RE. So while both diets have very different effects on the processes of fat storage and fat release, the net effect is essentially the same, all other things being equal. When we start focusing on fat movement in and out of an adipocyte, it’s easy to get lost in the notion that the more lipolysis (fat release) that happens the more fat loss will result. But getting fat out of the cell is only half the battle. The other half is what we mentioned at the very beginning of the post. It’s the process that people are actually referring to when they talk about “fat burning”…. fatty acid oxidation. Think about what happens when lipolysis is running. 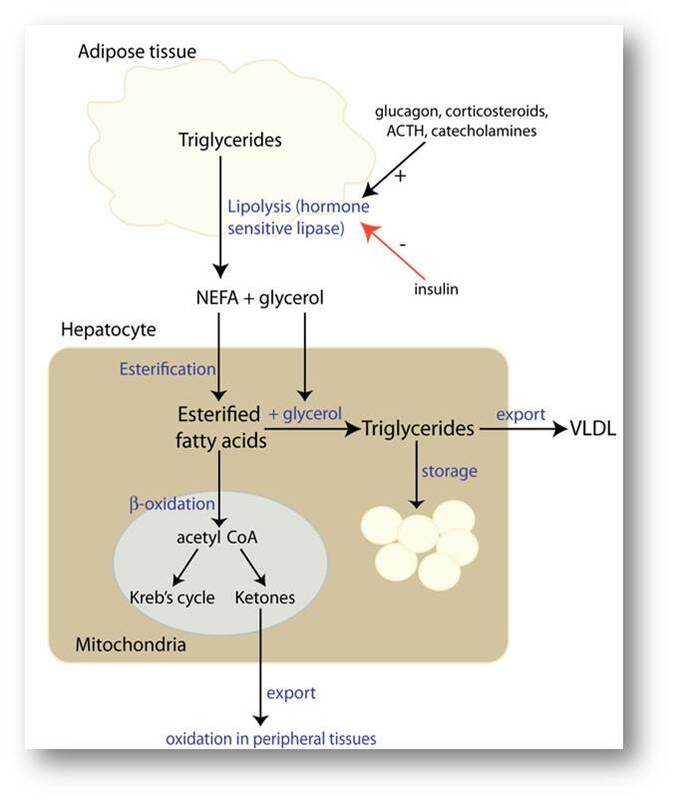 We are taking stored fat (in the form of triglycerides) breaking that down into fatty acids and glycerol, and releasing these free molecules into the bloodstream. But just because they are released into the bloodstream, it doesn’t mean they are going to be “used up” or “burned off”. The fatty acids need to go through beta-oxidation for that to happen. But oxidation is not necessarily the fate of these free fatty acids. They will only be used if we need to produce energy. And if we don’t need to produce energy at that time we aren’t just going to leave fatty acids floating around in the bloodstream. So we’ll just recycle them back to a cell for storage. Yep, they’ll be re-esterified and attached to a glycerol backbone and stored away as triglycerides again. So you can have all the lipolysis going on you want but if you don’t have sufficient energy demands for oxidation to be required, then those liberated fatty acids will just be returned to storage again. Now do you see why the bigger picture view is important? Is there an advantage to a high-fat diet for fat loss? So back to the question I posed in the intro to this post: could it be possible that there is a “metabolic advantage” to be had when in a state of low insulin levels (read: very low-carb diet)? Meaning, is it possible to drop more body fat on a very low-carb diet as opposed to a diet higher in carbohydrates and lower in fat, when calories and protein are matched? From a mechanistic point of view, looking at the processes involved in fat release from adipocytes as mentioned in the ‘moving fat in and out of a cell’ section earlier in this post, the hypothesis could be made that a very low-carb diet could lead to greater lipolysis due to the rock bottom levels on insulin on such a diet. But as was demonstrated, this will be essentially voided by the increase in re-esterification of fatty acids. Eating fat makes you burn more fat! Does it really play out like this though? From the research I’ve seen it doesn’t seem so. In THIS study from 2007 in the Journal of Clinical Endocrinology and Metabolism, 17 obese men received 4 wk ad libitum high fat-low carbohydrate (HF-LC) (66% fat, 4% carbohydrate) vs. moderate fat-moderate carbohydrate (MF-MC) diets (35% fat, 35% carbohydrate). Importantly however, both protein and calories are matched in a subgroup of 6 men who participated but with isocaloric feeding. This gives us a much better comparision and a way to assess the validity of a metabolic advantage of a low-carb diet. So for these 6 men, calories were the same (2,000 kcal/d) and protein was the same at 30% of calories (i.e. 150 g PRO/d). The study was a 4 week crossover study carried out in a metabolic lab (4 weeks on one diet, followed by 4 on the other. Intake controlled by the researchers). So what happened from a fat loss point of view? There were no differences in extent of the body composition changes experienced on either diet. I realise this is one single study but go look for one that shows this not to be the case. I haven’t seen any. What I will mention is that, as alluded to earlier, different macronutrients absolutely DO have different hormonal and metabolic effects in the body. They affect appetite, satiation, brain chemistry, etc. in different ways. This becomes really important when we ask “if putting on fat is caused by overeating, well what is causing us to overeat?”. From this question we get hypotheses such as food palatability and food reward being central to the obesity epidemic (Note: check out Stephan Guyenet’s material on food palatability and reward). So there are certainly other factors to consider when deciding on a dietary approach or the usefulness of a diet. All I’m saying however is that when calories and protein are matched, the simple practice of eating more fat will not lead to greater fat loss in and of itself. When we oxidise fatty acids we can generate ATP which can be used for energy production. In essence, this process is the fat-burning process we hear about. Taking available fat and using it up for the purposes of energy production. Sounds good so far. So where’s the problem? Just because we’re burning more fat, does that mean we are burning the fat that is stored in our fat tissue? On a high-fat diet or after we eat a high-fat meal, we are going to break the triglycerides in food down to fatty acids and glycerol. We’ll then have a ton of fatty acids readily available to be used for energy production. Additionally we know that we can oxidise intramuscular triglycerides (fat stored between muscle) and fat in VLDL particles. So all that fat we’re burning is the fatty acids in the bloodstream. And when we eat more fat, we have more of it in the bloodstream. 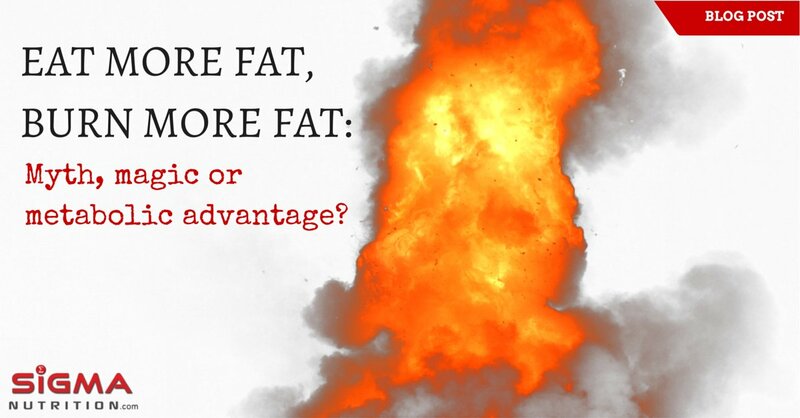 Meaning, if “burning more fat” simply equates to oxidizing more fatty acids then of course we should be burning more fat when we eat more fat… there’s a whole load more of it available, right? I mean that makes sense doesn’t it? What does this mean in relation to body fat levels? This is where things get a bit more interesting and very nuanced. At first glance, at least from as much as I’ve been able to conclude so far from the available evidence, is that the fat we’re burning is coming from the increased fatty acids made available to us from out meals unless… yep, you guessed it, we’re in a calorie deficit. I can’t seen evidence of any potential mechanism by which it is possible to lose body fat without having a negative energy imbalance (i.e. expenditure is higher than input). There are hypotheses of there being a “metabolic advantage” when in ketosis for example, but that’s far from accepted. But even beyond all that, even when fat IS released from fat cells, that still doesn’t necessarily mean we are actually losing fat. Does this mean high-fat diets have no use in a fat loss situation then? Absolutely not. I think high-fat diets (N.B. provided carbohydrates are low) can be an excellent tool for certain people. And I’ve talked about this previously. It really does come down to the metabolic state of the individual. In those with insulin resistance and blood sugar dysregulation then a low-carb/high-fat diet (LCHF) can be therapeutic and help return some insulin sensitivity, in turn putting the person in a better position to potentially lose fat. BUT (there’s always a but in nutrition) if we look at what actually happens in the process of fat and carbohydrate metabolism it starts to become clearer that fat loss really will be determined by caloric intake, with most other variables being equal (including protein intake, which is often forgotten about in studies). So yes, while you burn more fat on a high-fat diet, you have more of it to burn. And that is the key thing to remember. I should however point out that there are some excellent hypotheses on why low-carb/high-fat or ketogenic diets might be more effective in certain scenarios. And from a mechanistic point of view that makes sense. If you have dysregulation of the hormones that affect lipolysis, leading to poorer fat mobilization or release from the cell, then you could be in a situation where you are not dropping body fat despite only putting a small amount of fat into fat cells. I’ll also point out that there may be a case for the ketogenic state being beneficial as it gets the body “used to burning fat” or “used to running on fat”. However, I believe this just comes down to whether the person is metabolically flexible or not. If you’re metabolically flexible you should be able oxidise fat when you need to and oxidise glucose when you need to. But that topic is for another day. In conclusion, eat good quality food. Get your protein in. And eat at an intake level that mirrors your body composition goal. Fix fat and carb intake based on what works for YOU!